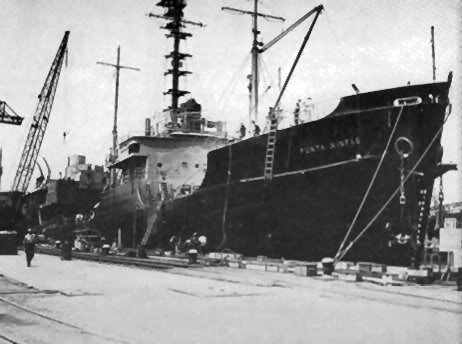 Laid down, 30 December 1941, as a Maritime Commission type (T1-MT-BT1) tanker hull, under Maritime Commission contract (MC hull 2625) at St. Johns River Shipbuilding, Jacksonville, FL. Largest Boom Capacity 5 tons. 26k ARA Punta Ninfas (B-15) moored pierside probably during an overhaul in a shipyard, date and location unknown.